And determined, Olive certainly is. 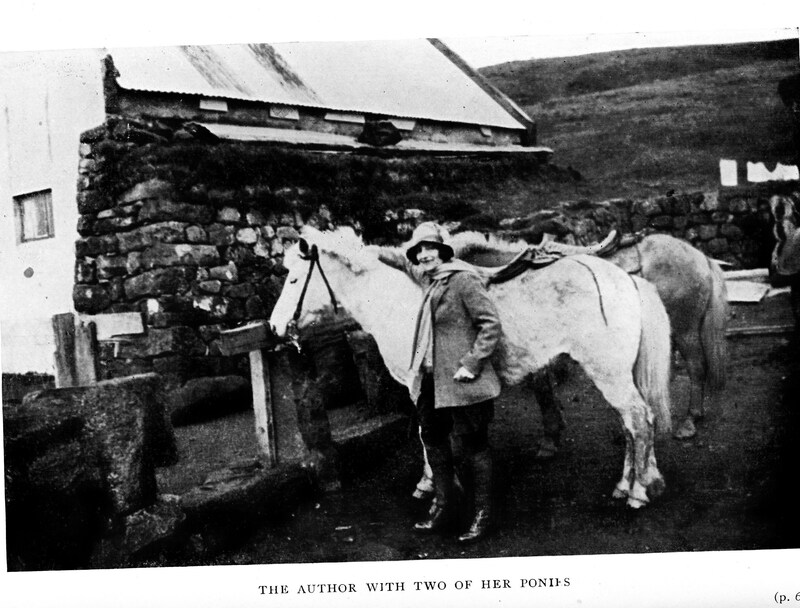 Remember, she is traveling alone, a woman in 1929, knows no Icelandic and has just a book of Icelandic phrases to use to tell people who she is and what she needs. She gets to the farm, not by horse, for things have changed, but in a truck. “The distance from Reykjavik is only about thirty miles, and as there is now quite a good road it is possible to motor. I got a seat in a timber lorry that was going in that direction. My suitcases and hold-all were wedged in between various packing-cases, and I sat in front between the driver and an elderly countrywoman who was travelling in my direction. We first had to collect goods in various parts of the town; this took some time and it was nearly 7 p.m. before we got away. “About 9 p.m. we came in sight of Kárastadir, the farm where I was to stay. It was away over moorland some distance from the road and built under the shelter of high hills that towered up behind and were streaked with newly fallen snow. And, so, there you have it, Olive is off on another adventure. She has heard about how beautiful Thingveller is, wants to see it, sketch it, visit the famous booths described in the sagas. She hasn’t had to ride a horse from Reykjavik to Thingvella. Instead, she’s got a ride in a lorry. The local people haven’t had to ride horses over moorland but are able to get rides on passing vehicles. There is a road and, although it is generously supplied with potholes, it is still a road. The isolation has begun to be conquered. Farm workers aren’t trapped for years on end on a farm. They can get to the big city (although Reykjavik isn’t very big, yet) and be in touch with city life. The stranglehold of isolation and poverty and the power of the large landowning farmers is gradually giving way. Reykjavik may not be Paris but it provides a look at a world where there are jobs, where you might have an option to be something other than an indentured servant. There is the chance, both for the farm family who provides Olive with lodging and meals, and for the guides she will hire, a chance to make some silver, currency instead of butter or wool. If Ketill and his father, Valgardur Jonsson, had this kind of house, they´d have stayed in Iceland instead of emigrating to Canada in 1878. However, 51 years have passed. Jonsson has been long dead. Ketill is 69. By 1929, much has changed in Iceland. One of those changes is the opportunity to get jobs off the farms, to escape from some of the draconian laws that controlled anyone who didn´t own a farm. However, all those who owned farms weren´t rich, money was hard to come by and tourism, although more possible because of steam ships, roads and motor vehicles, is still a trickle and the farmer where Olive stays will have been glad to add her silver coins to his purse. When Olive Murray Chapman reaches Reykjavik, she meets Mr. Stefan Stefansson, a local guide. He takes her to the Hotel Island. For those of you reading my blog posts about earlier times in Iceland, the news of an actual hotel will be an obvious marker of change. Over the centuries, the isolation, the paucity of visitors, the tremendous difficulty of internal travel, the overall poverty of the people, the lack of roads, meant that travelers, Icelanders. plus the few foreigners who braved Iceland’s harsh landscape, brought tents, stayed in farmhouses or churches. It is believed that the first inns in Europe were established once the Romans had built roads. They key to the existence of inns is the existence of roads which are then used regularly by travelers. These inns provided accommodation, food and fodder for horses. Stefansson tries to convince Olive that she should hire an English speaking guide and that she should choose and easier route. However, she is determined to go by Snaefellsnes, ride right around the peninsula, beneath the glacier, but Stefansson says her route would be off the beaten track. She is undeterred. Finally, he gives in and marks on her map the location of farms and the distance between them. Reykjavik has grown substantially. It now has around 20,000 inhabitants. The day after she arrives is Sunday and she goes out to see the city. She visits the public square. A band is playing, a large number of people are promenading around the green grass. She sees an outdoor pool with children being taught to swim. In books from the 19th C, it is often remarked that none of the fishermen know how to swim even though they risk their lives every day on the sea. She visits the open-air laundry and is told that some farmers have started to use the natural hot water on their farms to heat their houses. She goes to see the Roman Catholic Church of grey stone, is delighted with the “green plots of grass and familiar flowers” in gardens. She finds the National Museum interesting. The National Library impresses her. She comments on the importance of both chess and the Passion Hymns. She notes the “fine collection of the English classics” and on how interested people are in psychic research. She interviews Einar Kvaran who is the founder of the Icelandic Society of Psychical Research which was started in 1905. There are four hundred members and they have a good library. The doorbell rang and when I went to see who was there, I found a package that said, “Iceland Post”. When I opened it, there were four books that I am happily adding to my library. The photographs, text and design for all four books are by Björn G. Björnsson. In the book, Writer‘s Homes, there are pictures of Halldór Laxness´s home, GLJÚFRASTEINN.“Halldór Laxness was born in Reykjavík in 1902, and published his first book in 1919…from 1945 his home was at Gljúfrasteinn in Mosfellssveit (now Mosfellsbær).” There are pictures from the Culture House/Old National Library from SNORRSSTOFA, from Jónas Hallgrímsson’s Hraun, Oxnadalur. Large Turf Houses will be a favorite of visitors. It will be hard not to buy this book after visiting some of these houses. 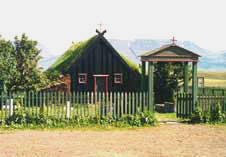 Icelandic North Americans frequently talk about the turf houses they have visited. They are fascinated in places that help them to see what living conditions were like for their ancestors before the great emigration. Admittedly, this collection of large turf houses is a bit misleading as to actual living conditions. Most of our ancestors didn’t live in places like Glaumbær or Laufás. Þvera, for example, “was built in the latter half of the 19th century. On either side of the entrance are two reception rooms.” However, as I write mostly about foreign visitors to Iceland in the 19th C and these visitors, being wealthy aristocrats or clergy of high social status, they did not stay with poor farmers and fishermen. They stayed with the upper class, the kind of people who lived in these large turf houses. These pictures give a real sense of what life could be like in Iceland if you had good land, some money and good political connections. As a North American Icelander, if there is such a thing, I’m grateful to Björn, for these books. The exterior and, perhaps, more importantly, the interior shots of the various buildings provide a clear view of what life was like for some Icelanders during the 19th C. According to his biography, Björn has worked as a designer with RÚV national TV. He also has designed sets and costumes for theatre, TV and film. He designs exhibitions for museums and visitor centres. He has made 70 TV programmes on historic buildings and sites and Icelandic cultural heritage. They are expecting 900,000 visitors in Iceland in 2015. I expect that the visitors to the turf churches, the large turf houses, the writer´s homes, the 18th Century stone buildings, will carry away a large number of these books. If you want to have copies, I´d suggest that when you are next in Iceland, you buy them before the visiting hordes appear. 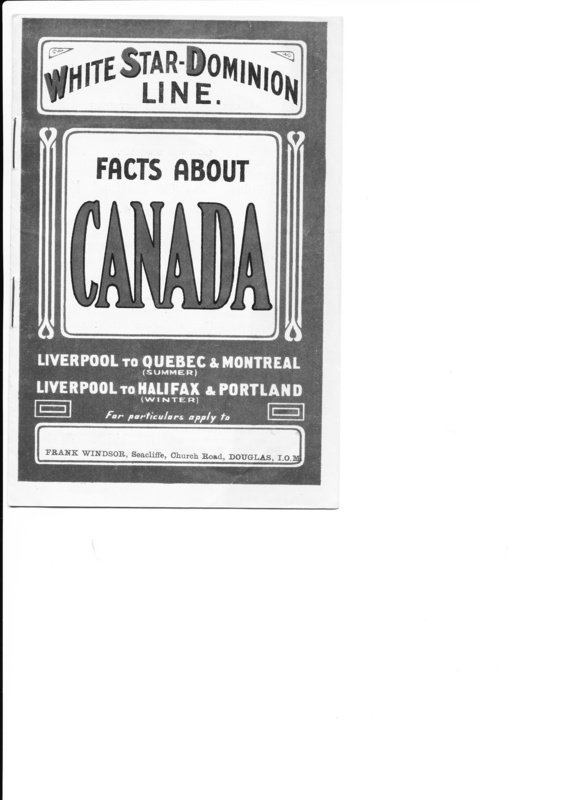 Olive Murray Chapman went to Iceland in 1929. She wrote a book, Across Iceland, about her adventure. Nineteen twenty-nine. Between the wars. WWI had ended in 1918, eleven years before her visit. WWII would begin in 1939, ten years after her visit. Much has changed in Iceland. The most noticeable changes are roads and motor cars, although as her book makes clear, the roads sometimes were dried stream beds and the roads often ended abruptly. Waiting at the end of such road were horses, ready to take her and others to their destinations. Think of it. An Englishwoman, on her own, not knowing the language, having only a pocket dictionary that was given to her by a friend. Her assets are self-confidence, good health and flexibility. She starts out by taking a taxi from Edinburgh to the docks at Leith. She finds the Brúarfoss which she describes as “beautifully clean and very well appointed.” Two hours later, the ship sets sail. There is a lot of cargo, chiefly timber. The weather is so bad that during the first twenty-four hours no one eats. However, the next day, the weather improves and the passengers all come to breakfast. One of the great charms of Olive’s book, if I may be so familiar as to call her by her first name, is its naivety. She meets “a cheery little Icelander” on board who speak English. She says to him that she is going to Iceland because “some years before I had met a charming Icelandic girl, and her description of the wonders and beauties of her native land had filled me with a desire to go and paint there. Also I was anxious to travel right across country from south to north if possible and to get to know something about the people and customs”. The Icelander wants to know how she’ll manage since she doesn’t speak Icelandic. She shows him her pocket dictionary and says she’s going to ask someone to write out the phrases she will need. The Icelander goes over a map with her. The ship, after stopping in the Westman Islands, reaches Reykjavik in four days. Given the early journeys of the sailing ships of the British explorers or even the ships that took the Icelandic emigrants to Leith, this is remarkable. Her description of the four hour stop in the Westman Islands contains some nice details. She describes how the local fowlers risk their lives to capture birds. She also describes the drying of cod. However, it is her description of the taking on of passengers that I found most interesting. I’ll write more about her journey. Although she is inclined to use adjectives with great abandon, she has a sharp eye and a good heart. By the time I finished this little book, I admired her greatly and wished that I could have known her. Her adventure is, perhaps, a small adventure, but it is definitely an adventure and took courage and resourcefulness. It is, after all, 1929. Travel in Iceland, in spite of motor cars, a few roads, and plucky little steamships, was still demanding . I’m not sure that I would have gone off to an unknown land with nothing but a pocket book of phrases.